Taxi fleets across B.C. will soon be increased by 15 per cent, but ride-hailing services like Uber won't be be on the streets until late 2019, the province has announced. Taxi fleets across B.C. will soon be boosted by 15 per cent, but ride-hailing services like Uber won't be on the streets until late 2019, the province has announced. Transportation Minister Claire Trevena made the announcement Thursday morning, in response to a new technical report from transportation expert Dan Hara. Despite the fact that services like Uber are already available in hundreds of cities around the world, Trevena denied that B.C. is behind the times. "I wouldn't say that we're far behind the times at all. I'd say that we're doing things in a very methodical way to ensure that we have safety for the people of B.C.," she told reporters. Even taxi drivers say they want to work for Uber, but will there be enough of them? 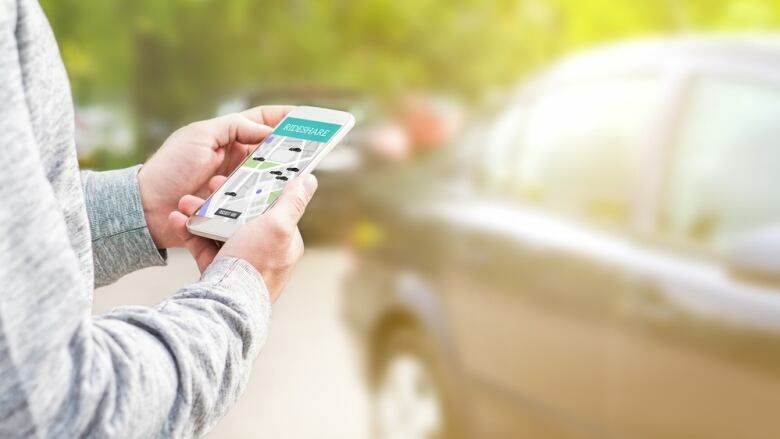 The minister pledged to introduce legislation opening the doors for ride-hailing services like Uber and Lyft this fall, and said she expects applications from ride-hailing companies to be submitted to the Passenger Transportation Board (PTB) by September 2019. "We know that people are frustrated and have been waiting far too long," Trevena said. During the last election campaign, the NDP pledged to bring in ride-hailing legislation by the end of 2017. Earlier this year, there was some suggestion that ride-hailing would be allowed in B.C. sometime in 2018. Hara's report recommended an immediate 15-per-cent increase in taxi fleets across the province, which would mean 300 more cabs in the Lower Mainland and another 200 throughout the province. The transportation ministry says it will begin working with the PTB right away to get those cars on the road. Trevena's announcement left a few observers scratching their heads. Though a government news release made it clear that ride-hailing services aren't expected to launch in B.C. until 2019, Trevena declined to give the same timeline when questioned repeatedly by reporters during a news conference. That disparity caused a bit of a misunderstanding for members of the advocacy coalition Ridesharing Now for B.C., who initially applauded the announcement, believing it was still possible ride-hailing services would arrive before the end of the year. Ride-hailing report shows road forward for regulation in B.C. Thursday morning, Ian Tostenson of the B.C. Restaurant and Food Services Association told reporters, "We are very, very happy with what we heard from the ministry today." But Tostenson later told CBC that he hadn't actually read the news release before commenting, and that Trevena's statements had left him with the wrong impression. "The question [from a reporter] was, 'Can you tell us if we're going to have ride-sharing by this Christmas?' And she didn't answer, but she never said 2019, because I think there would have been a huge outpouring of grief in the room," Tostenson told CBC. We are extremely disappointed in today’s announcement that ridesharing is going to take at least 18 months. BC deserve the same services that are available across Canada reducing impaired driving and increasing access to affordable, reliable service and they deserve it this year. After the confusion was cleared up, the coalition reversed course entirely, tweeting that members are "extremely disappointed" about the government's latest timeline.​ Tostenson said he hopes to work with the province to speed up the process. Spokespeople for both Uber and Lyft said they were also disappointed at the news. "Ride-sharing can be introduced more quickly than what the province has laid out today," Uber's Michael van Hemmen wrote in an email. Hara's report rejects a plan from the taxi companies to create a universal app that could be used across the province, writing that "the monopoly aspects of the proposal are found to be risky and unnecessary." Creating a usage-based insurance option for part-time drivers.